This super potent formulation contributes to the normal collagen formation and the normal function of bones and cartilage. 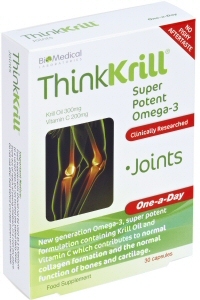 The benefits of Omega-3 Fatty Acids are well documented in providing important essential nutrients for Joint health as also is Vitamin C. ThinkKrill Joints has been specially formulated to provide you with your required daily intake in just one capsule dose. Using pure Krill oil the new generation Omgea-3, its phospholipid format is proven to be more bioavailable and more easily absorbed by the body when compared with the triglyceride format provided by fish oil. Krill oil also contains Astaxanthin a naturally occurring potent antioxidant which helps fight free radicals. The ThinkKrill range has been developed in line with the new legislation issued by the European Food Safety Authority (EFSA) and the approved clinical evidence to support Joint health. Independent clinical evidence submitted and approved by EFSA states that a 200mg daily intake of Vitamin C provides normal collagen formation and normal function of bones and cartilage. Together with 300mg of Krill oil this special formulation contains your daily dose to aid joint health.